Read this article about pulley reducers. The PR23 series of pulley reducers provide a cost-effective alternative to gear reducers often costing $400 or more. Use the PR23 with any NEMA size 23 stepper or servo motor to provide an increase in resolution and torque. Vibration reduction and load matching benefits can also be achieved to enhance the performance of many mechanical systems. Perfect for belt-driven and lead screw-driven XY positioners. Even though the output speed is reduced by the reduction ratio, some systems will actually have their overall speed performance increased due to better use of the motor's torque curve. This is particularly true on our X and XY belt-driven positioners where speeds can be increased by as much as 4 times by simply adding a 2.5:1 reduction. 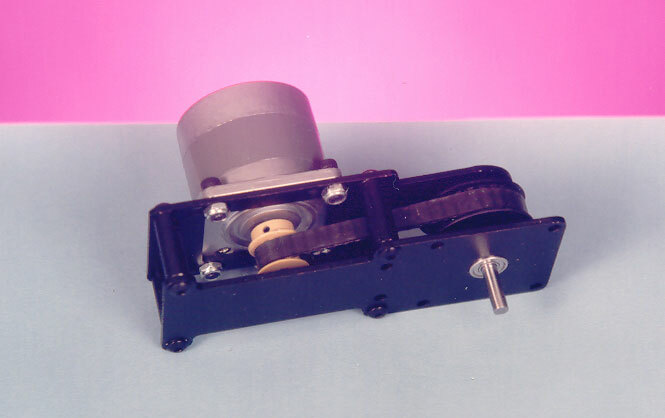 The PR23 face plate appears as a size 23 motor with a 1/4" shaft which allows the user to simply remove the motor from the system, mount it to the reducer, then mount the reducer on to the system. Timing belt tension is easily adjustable and pulleys can be swapped within the housing to provide an 'increase' function if needed. Five models are available providing ratios of 2:1, 2.5:1, 3:1, 4:1, and one model supplied with pulleys for all ratios. The simple yet rugged design incorporates precision ball bearings and requires no maintenance. Everything you need is included - pulleys, belts, hardware, and wrenches. See a mechanical drawing for the PR23 Pulley Reducer.